We were on our way to see Chicken Boy. Click HERE to reveal the mystery of Chicken Boy. 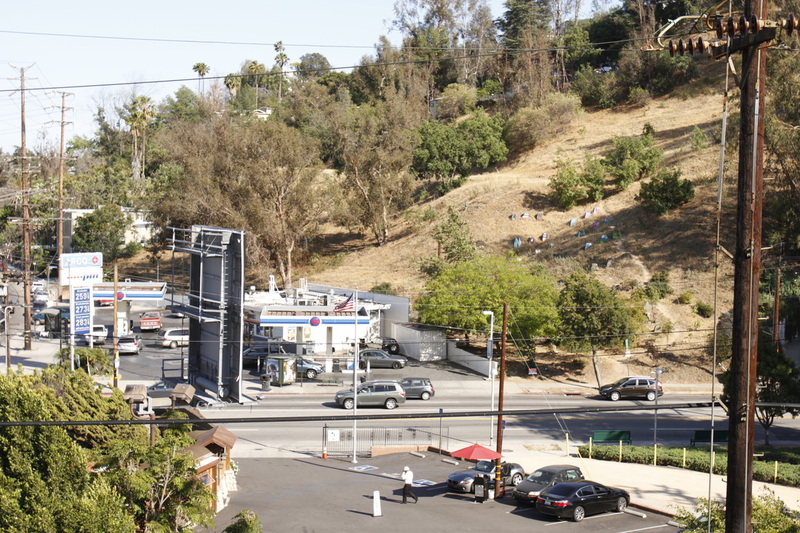 Passing through the intersection of Riverside and Fletcher in Silverlake, I saw Drew’s shoulders perk up and his eyes scouted the area in realization. “Would you mind a quick stop to see a random Outing?” He asked. (Absolutely!). “Sure, why not?” I replied. We parked in front of an Arco station and I looked around wondering if this Outing was obvious. He led the way behind the Arco station to a patch of land on the hill. On the hill sat several cement blocks. 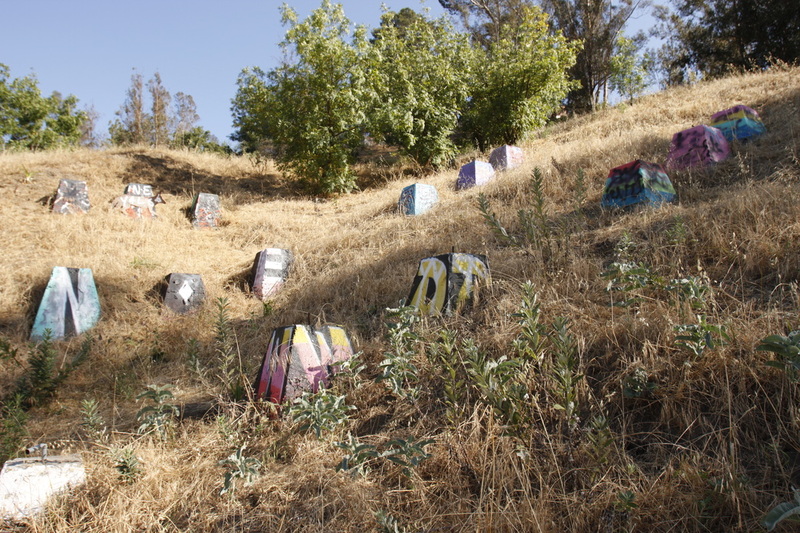 The cement blocks made the hill look as though it was a tiny graveyard. For a moment I thought we were trespassing on a land of tombstones. Drew explained that we were walking the Corralitas Red Car Path. From 1896 to 1955, the “Big Red Cars” were the major transport system of Los Angeles. In 1904, L.C. Brand and Association contracted the right-of-way through Silver Lake. This particular path was the home of the Fletcher Bridge for Los Angeles and Glendale electric railway which went out of service for freeway contraction in 1955. 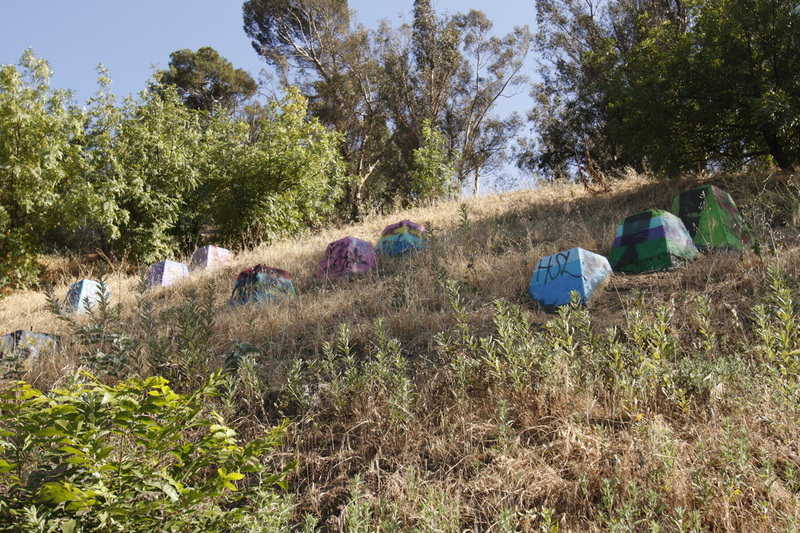 So what are these cement blocks now decorated with the artwork of a few who have visited? They are the remains of the 100-foot-tall trestle bridge which spanned between the two hills. The Red Car Trestle Footings are L.A. Historic Cultural Monument #770. The cement block are not the only ghosts of the railway. 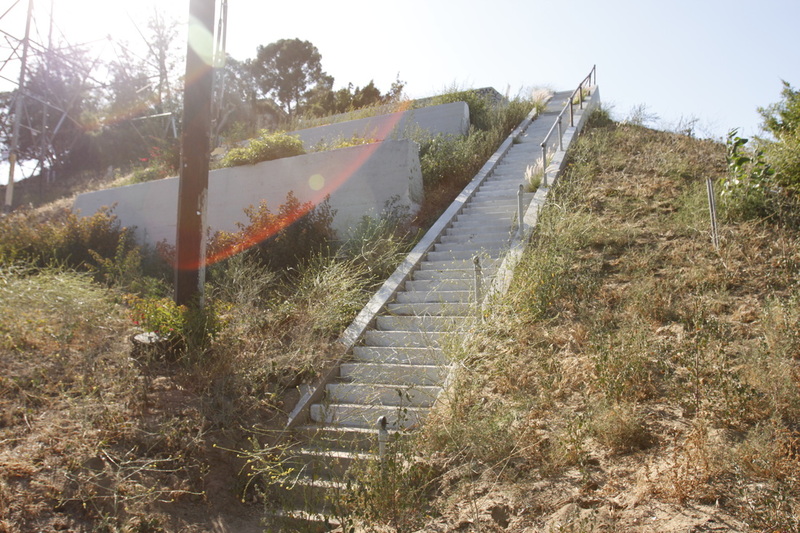 Across the street is a staircase which Drew dubbed, “The stairs to nowhere.” We made it to the top and took in the views of the “mini graveyard” and imaged for a moment what it must have looked like in 1955. We were standing on top of a staircase that once helped pedestrians access the trolley stop. Although at first glance, the cement blocks look like a graveyard, instead of burying, they are keeping alive an important part of L.A.’s history.